The partnership was signed on Thursday, March 28, 2019 at the Radisson Blu Hotel in Brazzaville, in the presence of the Prime Minister, Head of Government, His Excellency Mr. Clément Mouamba, and the Minister of the Forest Economy, Her Excellency Mrs. Rosalie Matondo. The ten-year project aims to substitute charcoal from deforestation of natural forests to supply the Brazzaville market. 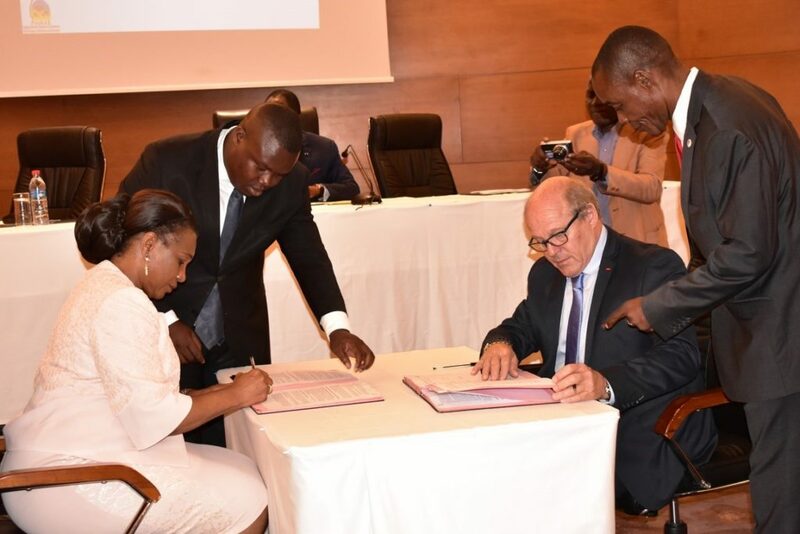 With a view to its implementation, the Minister of the Forest Economy, Rosalie Matondo, signed a partnership agreement on March 28 in Brazzaville with the Director General of the Batéké Brazzaville Forest Plantation Company (SPF2B), Bernard Cassagne. A company specializing in forest and agroforestry plantations on the Batéké plateaux, north of Brazzaville. “This project is a prime example of our country’s commitment to sustainable forest management at the highest level of government and is one of the responses to forest degradation and deforestation,” said Prime Minister, head of government, Clement Mouamba, patronizing this signature of convention. The land to be valorised under this project is split into three blocks: Inga, with an area of 1,842 hectares; Oka, 5,331 hectares; finally Ibina, 3,309 hectares. These sites are located respectively 70, 75 and 95 km from Brazzaville on the Batéké plateaux. The plantations started in October 2018 with already 300ha acacias planted. The annual rhythm is 500ha per year. The funding required for the implementation of the project will be sought by SPF2B, according to the agreement. The government will facilitate access to improved plant material available in the country. He will technically support the management of the nursery and, if necessary, facilitate the acquisition of seedlings from partners of the National Program of Afforestation and Reforestation (Pronar). The project will generate five hundred direct jobs in the influence area and serve as a catalyst for the development of village plantations. “The Congo must plant if it wants to be, in the future, a great forest country, to weigh in the forestry and industrial sector of wood processing in the subregion, in Africa and in the tropical world”, indicated the general director of the SPF2B, before pointing out that having his own nursery is a key element of success of such a project, because, a forest country of tomorrow is the one that plants, reforest destroyed lands, plant forest in new lands. “The planted forest produces twenty to forty times more wood than a natural tropical forest. It takes up less space, is easier to manage and operating costs are lower”, said Bernard Cassagne. aim of planting trees over a million hectares. The Congo has a long tradition of planting artificial forests dating back to the 1930s. The various research and development programs implemented successively allowed the set up of a Limba plantation in the Mayombe, on about five thousand hectares in the 1950s. The cloning of eucalyptus trees in the 1970s led to the development of plantations.